The biggest airplane in the world Stratolaunch went through first tests in the sky above USA. It spent in the air 2.5 hours and attained maximum speed of 304 km/h. In the future Stratolaunch will help to carry into space rackets. First flight trials of American launching aircraft Stratolaunch Model 351 took place above the Mojave Desert in California. Aviation Company Scaled Composites that participated in the project declared that they are proud of their colleagues who made first flight on this airplane. On the web-site of the company is underlined that the air vehicle that went through first tests from now one is the biggest in the world. This record was taken from Soviet machine AN-225 “Mria”. In the company marked that record launching aircraft took-off the ground for the first time on April 13th 2019, spent 149 minutes in the air and successfully landed in Mojave. The Company also marked that they project, construct and test the biggest airplane since 2012. The aim of this project is to make access to space positions much comfortable and safe. Stratolaunch consists of 72-meters long bodies connected to each other with common wing that is 117 meter long. The wing span is 117.3 meters – the biggest in entire history. The airplane is equipped with six engines Pratt & Whitney. The weight of the airplane is 250 tones with maximum load about 590 tones. The height is 4.69 meters. Movement on landing strip is effected with 28-wheel landing gear. 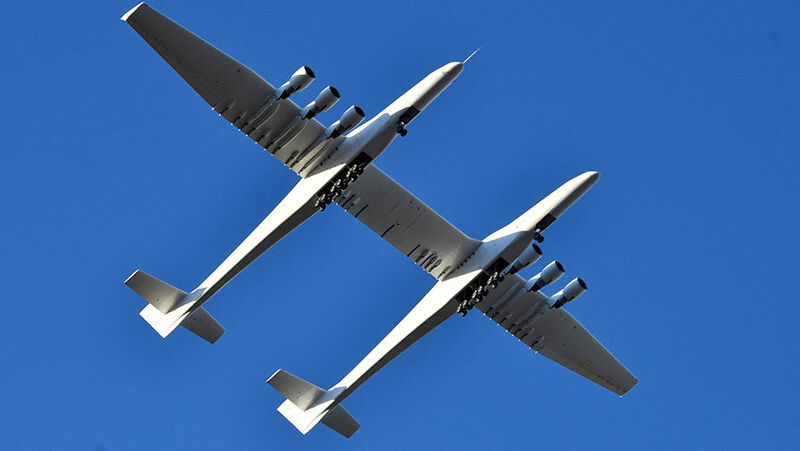 Stratolaunch Systems was created in 2011 by one of the founders of Microsoft Paul Allen. Strarolaunch was intended as aerial platform for launching boosters Pegasus XL that are meant for satellites’ delivery.